You all know how massive of a Sailor Moon fan I am, and about 5 or so years ago I started getting into the manga and from there, I've been slowly inching my way through different series. 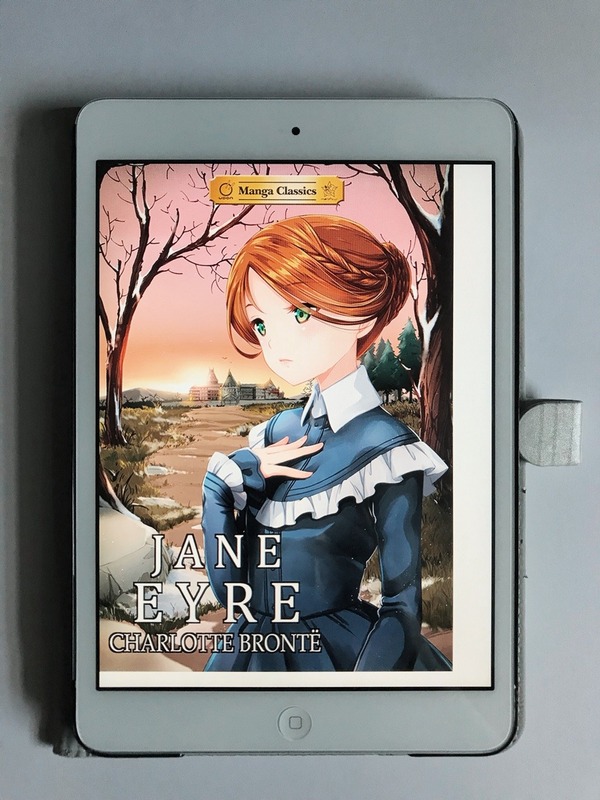 As I was browsing through Netgalley, two covers immediately caught my eye-- one was The Stories of Edgar Allan Poe and the other was Jane Eyre, both done in manga form. I immediately requested the two and to my delight both were approved the very next day. This was also my first approval on Netgalley so I was even more excited, so thank you to them for the e-copies. After spending far too long trying to figure out how to download/read the copies (told you, I'm a technology doof), I eagerly jumped into the Edgar Allan Poe one. I have to say, I really enjoyed this version of Poe's work. 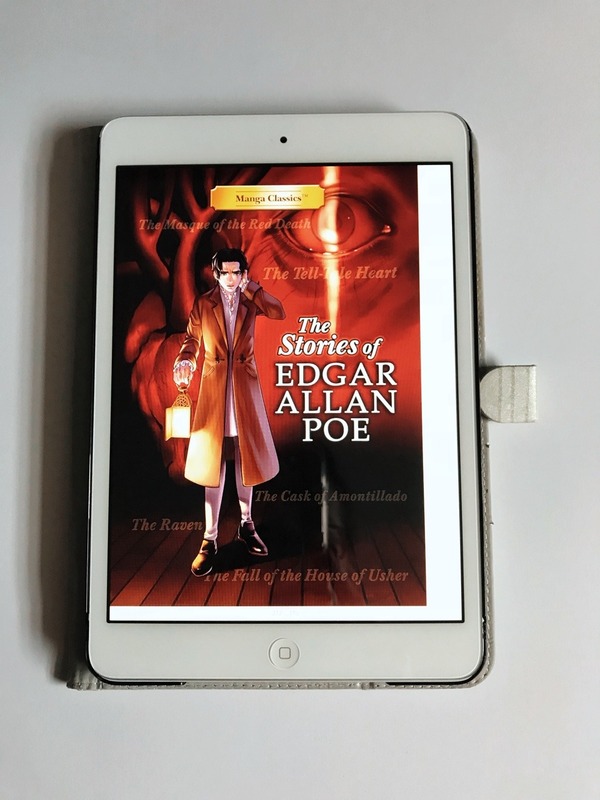 This collection has 5 of Poe's famous stories, from the ever popular "The Raven" (which was my favorite of the bunch) and "The Tell-Tale Heart" to "The Fall of the House of Usher." There's something so chilling about seeing the words come to life in the artwork, each story took on a whole new level of creepiness, which I loved. And let's talk about the artwork for a moment-- every story is depicted so wonderfully and with such detail. Everyone knows these stories, but reading them in this form brings a whole new perspective in such a cool different way. Besides the stories themselves, there's also some facts about Poe and tidbits about his work in here as well. I would've loved to have seen "Annabel Lee" done, but overall I thought this was great. I read the whole thing in one sitting. This is definitely one to pick up if you're a fan of Poe or horror in general. 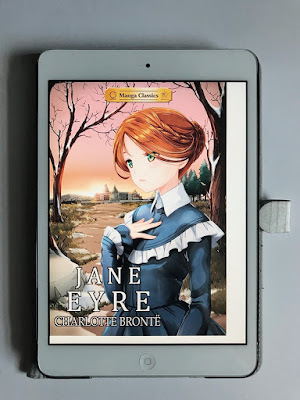 Now, I'll admit, I've never actually read Jane Eyre before. I have a copy of it and I'm familiar with the premise, and I've always said I'd get around to it eventually, but anytime I pulled it off my shelf it's just seemed daunting. So for those like me, this was such a nice intro to the classic tale because it didn't feel so cumbersome. The story itself came across very clear and easy to understand and from what I gather, it represented the original quite nicely. Obviously, not every little detail is included in this version, but even with the omissions the story is still pretty easy to follow. Everyone always has a picture in their heads of how they think characters should look, and I feel like this was done really well, and they did a lovely job of capturing the atmosphere of Thornfield Hall also. Overall, I thought it was pretty good. I liked these because it was like breathing a new life into these classic tales and it was so refreshing. I feel like a lot of people, young kids/teenagers especially, aren't drawn to classic stories because they feel as if they won't connect to the characters or whatnot, but I think these are great ways to ease kids into them. There are a bunch of other stories they've adapted into mangas, such as The Scarlet Letter and Sense and Sensibility, so I may check those out as well. If you're a fan of the classics, definitely check these out!